Black-footed ferrets are easily recognized by their distinctive masked faces and resemblance to pet ferrets. Native to North America, the black-footed ferret is a rare example of an animal that went extinct in the wild, but survived in captivity and was ultimately released again. 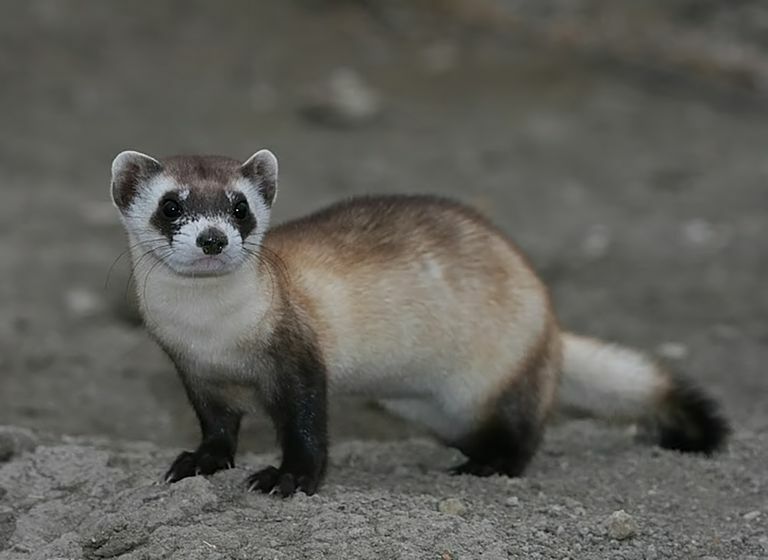 Black-footed ferrets resemble domestic ferrets as well as wild polecats and weasels. The slender animal has buff or tan fur, with black feet, tail tip, nose, and face mask. It has triangular ears, few whiskers, a short muzzle, and sharp claws. Its body ranges from 50 to 53 cm (19 to 21 in), with a 11 to 13 cm (4.5 to 5.0 in) tail, and its weight ranges from 650 to 1,400 g (1.4 to 3.1 lb). Males are about 10 percent larger than females. Historically, the black-footed ferret roamed across the prairies and steppes of central North America, from Texas to Alberta and Saskatchewan. Their range correlated with that of prairie dogs, since ferrets eat the rodents and use their burrows. After their extinction in the wild, captive-bred black-footed ferrets were reintroduced across the range. As of 2007, the only surviving wild population is in the Big Horn Basin near Meeteetse, Wyoming. Around 90 percent of the black-footed ferret's diet consists of prairie dogs (genus Cynomys), but in regions where prairie dogs hibernate for winter, ferrets will eat mice, voles, ground squirrels, rabbits, and birds. Black-footed ferrets get water by consuming their prey. Ferrets are preyed upon by eagles, owls, hawks, rattlesnakes, coyotes, badgers, and bobcats. Except when mating or raising young, black-footed ferrets are solitary, nocturnal hunters. Ferrets use prairie dog burrows to sleep, catch their food, and raise their young. Black-footed ferrets are vocal animals. A loud chatter indicates alarm, a hiss shows fear, a female's whimper calls her young, and a male's chortle signals courtship. Like domestic ferrets, they perform the "weasel war dance," consisting of a series of hops, often accompanied by a clucking sound (dooking), arched back, and frizzed tail. In the wild, the ferrets may perform the dance to disorient prey as well as to indicate enjoyment. Black-footed ferrets mate in February and March. Gestation lasts 42 to 45 days, resulting in the birth of one to five kits in May and June. The kits are born in prairie dog burrows and don't emerge until they are six weeks old. Initially, the kits are blind and have sparse white fur. Their eyes open at 35 days of age and dark markings appear at three weeks of age. When they are a few months old, the kits move to new burrows. Ferrets are sexually mature at one year of age, but reach peak reproductive maturity at age 3 or 4. Unfortunately, wild black-footed ferrets typically only live one year, although they can reach 5 years of age in the wild and 8 years of age in captivity. The black-footed ferret is an endangered species. It was "extinct in the wild" in 1996, but downgraded to "endangered" in 2008 thanks to a captive breeding and release program. Initially, the species was threatened by the fur trade, but it went extinct when prairie dog populations declined due to pest control measures and conversion of habitat to cropland. Sylvatic plague, canine distemper, and inbreeding finished off the last of the wild ferrets. The U.S. Fish and Wildlife Service artificially inseminated captive females, bred ferrets in zoos, and released them in the wild. The black-footed ferret is considered a conservation success story, but the animal faces an uncertain future. Scientists estimate only about 1,200 wild black-footed ferrets (200 mature adults) remained in 2013. Most reintroduced ferrets died from ongoing prairie dog poisoning programs or from disease. While not hunted today, ferrets still die from traps set for coyotes and mink. Humans pose a risk by killing prairie dogs directly or by collapsing burrows from petroleum industry activities. Power lines lead to prairie dog and ferret deaths, as raptors perch on them for easy hunting. At present, the average lifespan of a wild ferret is about the same as its breeding age, plus juvenile mortality is very high for those animals that do manage to reproduce. Although some domestic ferrets resemble black-footed ferrets, the two belong to separate species. Pet ferrets are descendants of the European ferret, Mustela putorius. While black-footed ferrets are always tan, with black masks, feet, tail tips, and noses, domestic ferrets come in a wide variety of colors and usually have a pink nose. Domestication has produced other changes in pet ferrets. While black-footed ferrets are solitary, nocturnal animals, domestic ferrets will socialize with each other and adjust to human schedules. Domestic ferrets have lost the instincts needed to hunt and build colonies in the wild, so they can only live in captivity. Feldhamer, George A.; Thompson, Bruce Carlyle; Chapman, Joseph A. 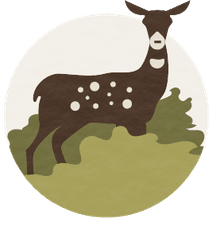 "Wild mammals of North America: biology, management, and conservation". JHU Press, 2003. ISBN 0-8018-7416-5. McLendon, Russell. "Rare U.S. ferret marks 30-year comeback". Mother Nature Network, September 30, 2011. Owen, Pamela R. and Christopher J. Bell. "Fossils, diet, and conservation of black-footed ferrets Mustela nigripes ". Journal of Mammalogy. 81 (2): 422, 2000. Is the Hammer-Headed Bat a Real Animal?